In the Dutch city of Eindhoven, engineers, contractors and architects have joined forces to create one of the world’s first 3D-printed commercial housing projects. 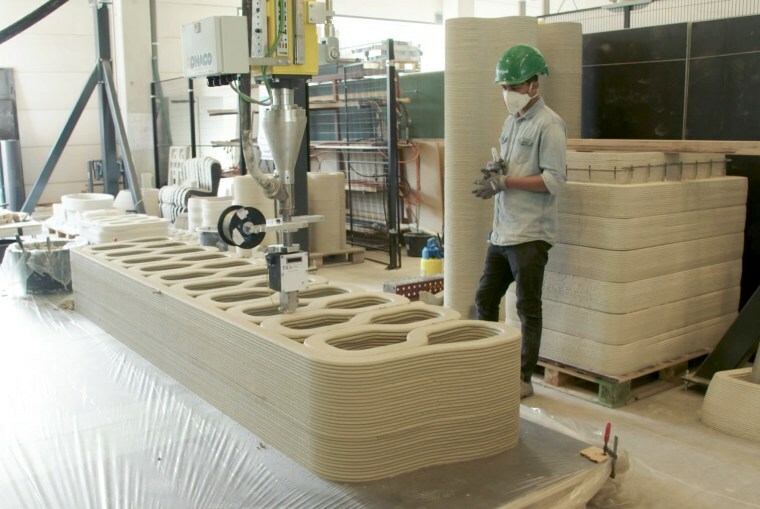 Dubbed Project Milestone, the initiative will use a huge 3D printer to fabricate five concrete houses in a wooded area near the city’s airport. Plans call for the first home, a three-bedroom dwelling of just over 1,000 square feet, to be completed in mid-2019 — though the entire initiative will take five years because the technology is still being refined. The robotic printer used to create the homes will follow architectural plans to put down layers of a special concrete mix. The first house’s roof and walls will be fabricated off-site and then brought to the building site for assembly. Once the technology is honed, it should be possible to print an entire home on site. Renderings of the planned homes show futuristic-looking structures with curvilinear shapes and rectangular windows and doors. The designs are intended to show off the printer’s versatility, including the ability to create unusual shapes that are hard to make with conventional construction methods, van Gurp said. But will 3D printing really revolutionize the construction industry? Carlo Ratti, an architect and professor of urban technologies and planning at the Massachusetts Institute of Technology, told MACH in an email that while he believes digital fabrication will revolutionize construction, 3D printing in concrete is unlikely to be the key. “Still, it is positive that we are seeing a myriad [of] experiments in concrete printing — Project Milestone is one of them — that will be useful to perfect the technique,” he said. The project certainly seems to have captured the attention of people looking for a place to live. Within a week of the renderings’ release, van Gurp told The Guardian, 20 families had applied to rent the first home. This entry was posted in Bedford Corners NY and tagged Bedford Corners NY Luxury Homes on July 4, 2018 by Robert Paul.